Recent release “PPH Took My Daughter” from Page Publishing author Norma D. Soto is an uplifting memoir of her daughter’s struggle with the disease Primary Pulmonary Hypertension. Fatal as it was, the author and her family must find strength in each other and God to overcome this obstacle. Norma D. Soto, a loving mother, grandmother and debut author, has completed her new book “PPH Took My Daughter”: an emotional memoir of her daughter’s struggle with the disease Primary Pulmonary Hypertension. 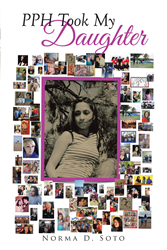 Published by New York City-based Page Publishing, Norma D. Soto’s adjective tale tells the true story of her daughter Priscilla’s diagnosis of Primary Pulmonary Hypertension (PPH), a very rare and dangerous disease. When Priscilla found her way to Heaven at only age 25, the author and her family were left to fight through the pain themselves. With the help of and faith in God, the author and her family learned to overcome this seemingly impossible obstacle and rejoice in Priscilla’s life and memory. This heartbreaking and heartwarming work is an aid for anyone with PPH in their lives, or anyone who needs the strength of God to conquer the pain of love and loss. Readers who wish to experience this moving work can purchase “PPH Took My Daughter” at bookstores everywhere, or online at the Apple iTunes store, Amazon, Google Play or Barnes and Noble.